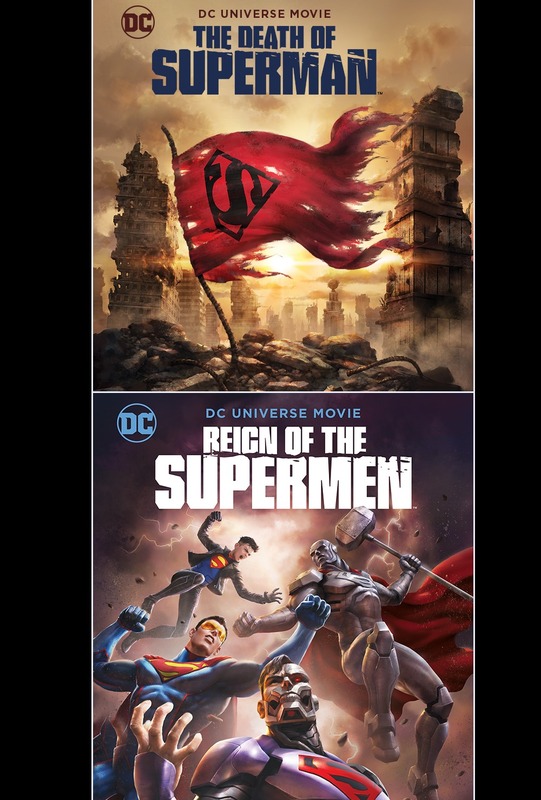 Fathom Events today provided two DC Animated movies that showed that it is possible to make a compelling and interesting film focusing on Superman. The Death of Superman was a direct-to-DVD from last year and told the story from the iconic DC Comics comic book from 1993, Superman #75. This was one of the comics that Batman v. Superman took and crammed together for their story arc. This is evidence proving that the choice to rush through the storyline in the live action films was a huge mistake. At the end of the animated version, when Superman sacrificed his life to save Lois Lane from the rampaging Doomsday, I was feeling the emotions. There were some tears in my eyes whereas I felt nothing during the whole BvS mess. They followed this up with a new release of Reign of the Supermen, which continued the storyline from the comics where a group of “new” Supermen (a clone Superboy, The Eradicator, Steel and Cyborg Superman) stepped forward in the absence of Kal-El to stand in his stead. Quick takes on these two animated films. I thought The Death of Superman was fantastic from start to finish. Loved just about everything about it. Reign of the Supermen dragged a bit for me at the start, but the last half of the film was just excellent. Once again, as I stated with my review of Justice League: Gods and Monsters, maybe it is time that Warner Brothers divvy up some cash so these DC Animated movies can get some better animation. There is no doubt that the animation on these films are below average, if not downright cheap looking and that is a damn shame because the storytelling is top-notch. WB should take some of that Aquaman moolah and see if they couldn’t come up with the next Spider-man: Into the Spider-verse-style film using the wealth of wonderful characters that DC has. Back to the double feature, I found the pay off to be strongly done once again. Not only did we get the best representation of Superman we have gotten since Christopher Reeve (or maybe Superman: The Animated Series), but we got the Justice League cameos as well. Both Flash (Christopher Gorham) and Green Lantern (Nathan Fillion) stole the show. Rosario Dawson’s Wonder Woman was another highlight. The voice cast was solid. Jerry O’Connell as Superman. Rebecca Romojn as Lois Lane. Rainn Wilson as Lex Luthor. All three stood out as great castings. Being able to watch the two films together in one event was an awesome treat and it really helped the second film. I feel that if it hadn’t had that strong intro, the relatively weaker beginning of the second film would have stood out more. As it is, it just felt like a slower bit necessary in the story. This is what the DCEU should have worked toward instead of throwing away Superman’s death as a moment in a movie that did not need it. This is so much more compelling and emotional than the Superman death in BvS that it showed what could have been.